The Mystery Maven of Canada is none other than Linda Wiken, a former bookstore owner in Ottawa and successful mystery author writing the Berkley Prime Crime series under the name Erika Chase. Before I wrote my first word as a fiction author there were certainly many writers who inspired me to try my hand at it; Gail Bowen, Sue Grafton, Robert B. Parker, Patricia Cornwell, David Eddings and Michael Nava to name just a few. In the list are writers who write in varied genres, from mystery to thriller to fantasy to romance. I wanted to be all of them but of course ended up being none of them. Which is a good thing. A writer has to find their own voice. No matter how much you think you are a certain kind of writer, until you’ve put pen to paper you really don’t know what voice will emerge. Now I realize that the way these writers influenced me was not so much by the specifics of their words but how they made me feel when I read them – inspired, entertained, happy, sad, on edge, comfortable. I want to make readers feel something and have a special ‘experience’ when they spent time with my books. Knowing it’s possible is how I was most influenced by these great writers. And continue to be. For a decade I wrote a mystery series featuring a Canadian detective named Russell Quant. In the spring of 2013 I released my first book in what I hoped might become a new series. In a new genre. New protagonist. New style. Risky. Scary. Exciting. The first book, When The Saints Go Marching In features Canadian Disaster Recovery agent Adam Saint. And, happily, I am now working on the second Adam Saint book. That’s an interesting question for me right now. I’ve always held that an author always leaves a part of themself in almost every character they create, even if just a wee tint. With Russell Quant that is certainly the case. Although we have many differences, I can safely say we are more alike than different. With my new protagonist Adam Saint, the opposite is true. This is a wonderful challenge for me after spending a decade with Quant. I am constantly having to bring myself to a shuddering halt as I write scenes having Saint react in a very Quant (Bidulka?) manner. Quant knows when to stop for a good meal and bottle of wine. Saint goes until he’s bloody and bruised and long out of ammunition of any sort. With Quant you see the character’s inside life very clearly. Saint is—sometimes frustratingly so—much harder to read. His shell is thick and harder to penetrate. This resistance to show who he is, what he feels about things, about people, ends up being part of the voyage that we’ll see develop in these books. And I as a writer right alongside. As a mystery/suspense writer plot is undeniably important. It’s the layer of steel girders upon which I rest everything else. Like any big building, without the girders of plot, story falls apart. The book falls apart. Characters fall flat on their faces. That being said, the true driver of my books—and me as a writer—are my characters. Thinking about, creating, molding, giving birth to and guiding through (fictional) life is what I love to do. I know many of my readers would agree. When they discuss with me whatever recent book they’ve read, they always refer to characters rather than plot. 5. Are you a ‘pantser’ or a plotter? As I’d not heard the term ‘pantser’ until this interview, I am confident in saying I’m totally Team Plotter! In my early years as a writer I would create three outlines for every book. One was the ‘whodunit’ outline, one was the ‘character arc’ plotline, and the third shmushed (Is that a word? Hope so!) the first two together. Today my version of outlining is a little more streamlined. I still have a general outline that tells the story from beginning to end, which I later apportion into bite-size chapters. (A process that never ends up with the book having the same number of chapters as I’d thought I’d have). I also create an ever-evolving biography for each of a book’s main characters. These include everything from eye colour, family background, favourite foods, and names of pets. I’ve evolved into a process where I am comforted by a certain adherence to a storyline/plot that I know works and has a definite beginning, middle and end, but freed from the shackles of a pre-defined inflexible structure. Which is why I never end up with the same number of chapters I planned for (see above). I know the direction I’m going but not all the side roads and back alleys I’ll end up taking to my final destination. Part of the fun of fiction is spontaneity and the freedom to create and use your imagination. I suppose this is a bit of a reflection of how I live life. I’m a planner. The cost, at times, can be spontaneity. But boy do I get a lot done. And along the way I always make time for creativity and a little bit of uncertainty. There are books that I read that whenever I’ve put them aside because of sleep, work, life I find myself thinking about them. When it’s time to return to them I get a deliciously satisfied, warm, happy, cozy feeling. This is what I want readers to take from reading a Quant or Saint book. I want them to have an experience, a moment, a communion with the characters. I want them to be taken away on a journey where they might laugh or cry or learn something or simply be entertained. I like nothing better than when a reader writes to tell me about how they enjoyed a hot summer afternoon on their deck with a cold pitcher of lemonade or curled up on a couch in front of a fire, dog at feet, rum toddy in hand and spent a few hours in the company of Russell Quant or Adam Saint. Ooooo, good one. Let me think about this. Well, I do like change. Yet I love being immersed in the lives of familiar characters. I think it might be perfect to have…isn’t that funny…I was about to describe a scenario not too dissimilar from what I have now. Two series. One established, one new and untried. Maybe have a book out each year in alternating series. Whenever one of the series has reached the end of a nice lifespan, try out another. Maybe inch into a new genre or try to reach a new type of readership. A mix of comfort and nervous newness at the same time. Then again, I like to travel and entertain and sit in the sun, so maybe I’ll just do a lot more of that in ten years! Between Facebook and websites and Twitter and YouTube and Flickr, how could there be anything? I think newer readers might be surprised to know that I have three university degrees and spent a decade as a corporate auditor. Others might be surprised to know that I left that well-paying career to write full time without an agent, potential story line, or even one publishing credit to my name. All I had was the desire (and support of a fantastic spouse) to use an undetermined chunk of my lifetime to pursue passion. Mysteries. Thrillers. The occasional fantasy novel. Travel magazines. When no one is looking: Entertainment Weekly. Man of action Adam Saint: tough-as-nails, luxury-loving, Canadian Disaster Recovery Agent whose job it is to take care of you on the worst day of your life. 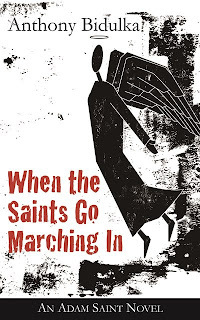 When the Saints Go Marching In is the first book in the highly anticipated new series by author Anthony Bidulka. The fast paced suspense novel features a new kind of hero, Disaster Recovery Agent Adam Saint. Bidulka is best known for the long-running award-winning mystery series featuring Russell Quant, a world-travelling, wine-swilling, wise-cracking, gay, Canadian PI. The Quant series is a multi-award nominee including for the Crime Writers of Canada Arthur Ellis Award, ReLit Award, Lambda Literary Award and Saskatchewan Book Award. Flight of Aquavit was awarded the Lambda Literary Award for Best Men’s Mystery. 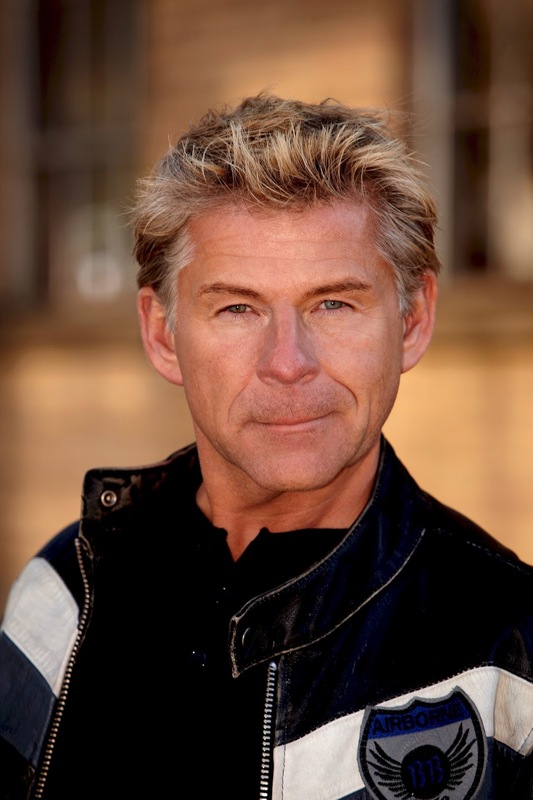 Anthony has toured extensively and spoken at conferences and literary events throughout Canada and the United States and is a great believer in community involvement. He lives in Saskatoon, Canada and loves to travel the world and throw a good party. Please visit Anthony at www.anthonybidulka.com, Facebook, Twitter (@abidulka), and YouTube.